There’s no denying that Goa is a complete package of fun, thrill, and adventure. But if you think this is the entire deal, you haven’t been on a road trip from Hyderabad to Goa. Marked with stunning views and vistas, this drive will leave you mesmerized and thrilled at the same time. As you make your way through the scenic routes that take you from Hyderabad to your hotels in Goa, you can explore a number of attractions en route. Up for an exciting road trip from the land of Nizams to the party capital of India? Here’s a quick guide on the various routes you can take while driving from Hyderabad to Goa by car or bike. This is the most preferred route for traveling from Hyderabad to Goa by road. It courts you through the chaotic roads of Hyderabad before leading you on to the peaceful roads devoid of much traffic. Adding to the beauty of the drive are a number of temples, forts, lakes, waterfalls, and other attractions. If scenic beauty is what your heart desires when you are out on a road trip, this route is sure to impress you. Route: Starting from Hyderabad, this route leads you through Mahabubnagar, Raichur, Sindhanur, Dharwad, and Anmod, before you reach the beach haven of Goa. Pillala Marri Giant Banyan Tree: A gigantic banyan tree, Pillalamarri is more than 800 years old and makes for an excellent stopover on this route. The huge tree is spread across 4 acres and makes for a great spot to enjoy a picnic. Gadwal Fort: Counted amongst the most prominent landmarks of Gadwal, the Gadwal Fort is an imposing structure. Several ancient temples are housed within the fort. It is an excellent spot to witness the grandeur of another era. Raichur Fort: Nestled on a hilltop, the Raichur Fort lets you enjoy exceptional views of the surrounding areas. If you are a photography enthusiast, you will find this fort an excellent spot to capture many post-card worthy pictures. Panchmukhi Anjaneya Temple: The Panchmukhi Anjaneya Temple is dedicated to Lord Hanuman in his five-faced avatar. 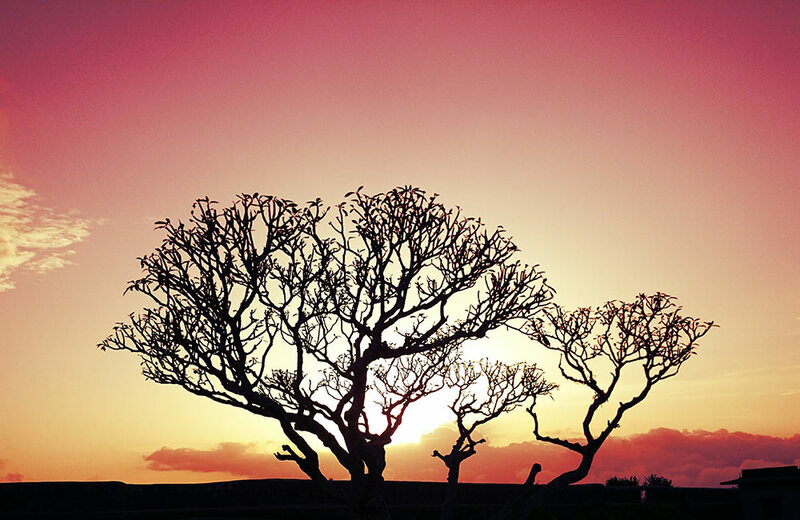 It is a lovely spot with a tranquil vibe enveloping it and makes for a great spot to spend some relaxing moments. 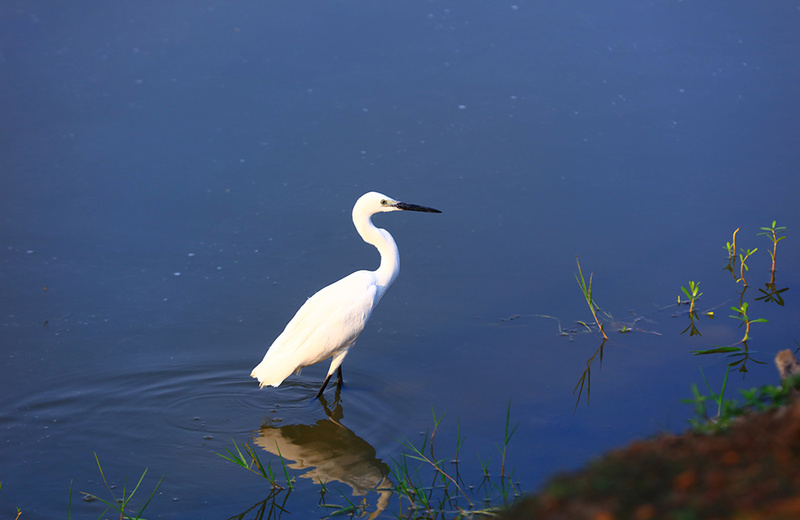 Unkal Lake: This sprawling lake stands on the outskirts of Hubli and offers amazing views of the setting sun. It is an ideal picnic spot to enjoy a boat ride amidst natural surroundings. The statue of Vivekananda situated in the middle of the lake adds to its attraction. 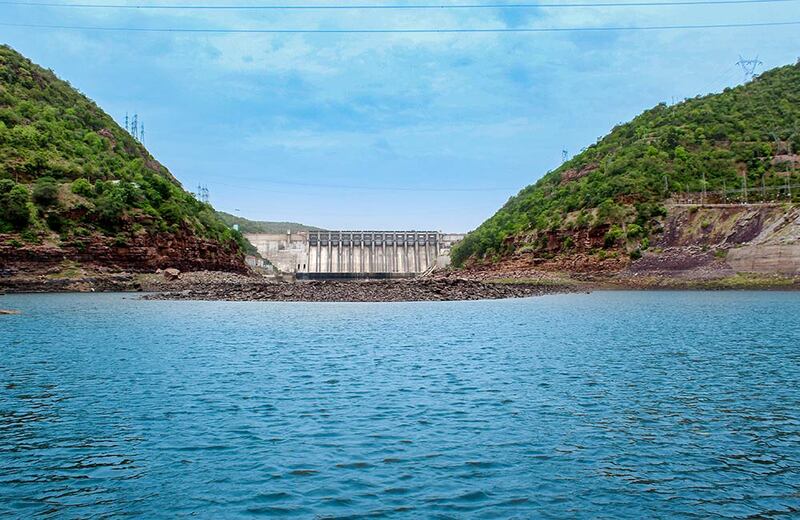 Nrupatunga Betta: It is a picturesque hillock that provides breath-taking views of the Unkal Lake as well as the cities of Hubli and Dharwad. The lovely hillock is a wonderful spot for enjoying a picnic with your family and friends. 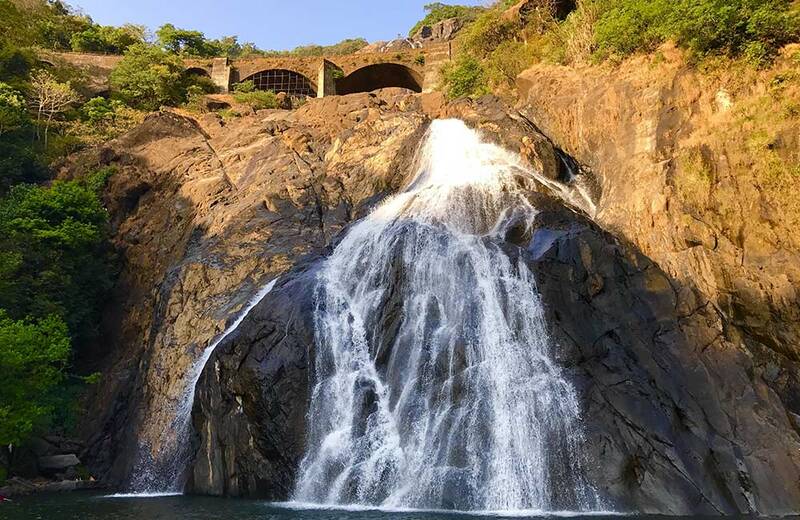 Dudhsagar Falls: A four-tiered waterfall, Dudhsagar offers one of the most magnificent sights on this route. The gushing waterfall rushes down from a height of more than 300 meters, offering a spectacular visual treat. Picturesque surroundings and scenic spots are the highlights of the trip from Hyderabad to Goa by road via Belgaum. Since this route is speckled with forts, caves, temples, monuments, waterfalls, and other wonderful stopover options, you will have a great time driving through it. You can even halt for the night at Gulbarga and explore the age-old ruins in Bagalkot before continuing your trip. Route: This route commences from Hyderabad and proceeds through Zaheerabad, Gulbarga, Bagalkot, Belgaum, Mollem, and then reaches Goa. Gulbarga Fort: Apart from the palaces, mosques, tombs, and other structures displaying impressive Islamic architecture, Gulbarga Fort is also home to the world’s longest cannon. This 23-foot long cannon is the main draw of this fort. Khwaja Bande Nawaz Dargah: This dargah in Gulbarga, which is the final resting place of the Sufi saint Syed Muhammad Hussaini, is a beautiful monument highlighting Indo-Saracenic style of architecture. The serene ambiance of the dargah adds to its appeal. Buddha Vihar: The Buddha Vihar complex is a lovely Buddhist spiritual center in Gulbarga where you can see the merger of architectural features from prominent Buddhist centers like Sarnath, Sanchi, Nagpur, and Ajanta. 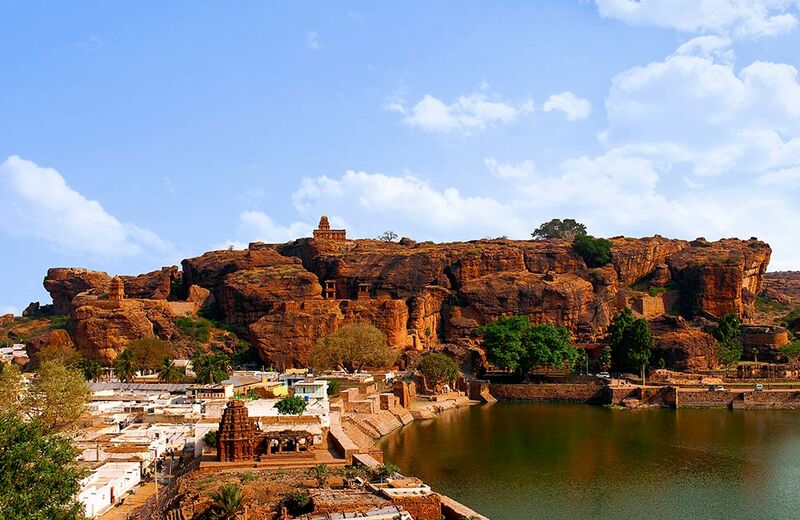 Badami Caves: Located in Bagalkot, Badami is an ancient cave complex comprising Hindu, Jain, and Buddhist cave temples. Dating back to the 6th century, these caves are excellent examples of Indian rock-cut architecture. Malegitti Shivalaya Temple:A grand rock-cut temple dedicated to Lord Shiva, this 7th century structure in Bagalkot is an astounding example of ancient Chalukya architecture. Lad Khan Temple: Dedicated to Lord Shiva, it is among the oldest Hindu temples in Bagalkot. It was named as Lad Khan Temple since a person of this name had turned this structure into his residence for a short duration of time. Pattadakal Monuments: A detour from Bagalkot to Pattadakal will let you enjoy the splendid architectural beauty of a complex of Hindu and Jain temples belonging to the 7th and 8th You can witness a tasteful blend of architectural styles from northern and southern India in Pattadakal Monuments. Gokak Falls: It won’t be wrong to describe this stunning waterfall near Belgaum as a scaled down version of Niagara Falls. During the monsoon season, the waterfall assumes a majestic look. You can also pay a visit to the ancient Mahalingeshwara temple that boasts of Chalukya style of architecture. This may be the longest among all the three routes described here, but you won’t feel the difference since this route too offers its own set of attractions. Whether you love wildlife or ancient monuments or even ruins, you will get to explore all these and more while traveling on this route. If you feel like taking it a bit slow, you can stay overnight in Hampi before hitting the road the next day with fresh energy and enthusiasm. Route: This route chalks its way out from Hyderabad through Mahabubnagar, Kurnool, Ballari, Hospet, Hubli, Dharwad, and finally wraps up in Goa. Konda Reddy Fort: Perhaps the most prominent landmark in Kurnool, the Konda Reddy Fort delights tourists and history buffs alike with its impressive structure. It offers excellent opportunities for photographers to capture great views of the city. Bellum Caves: How about taking a peep into the longest and largest cave system open for public viewing in India? These ancient caves were formed over a period of tens of thousands of years and are famous for their stalagmite and stalactite formations in varied shapes and textures. Yaganti Temples: This Lord Shiva temple in Kurnool dates back to the 15th century and was constructed in the Vaishnavaite tradition. There are three caves inside the temple complex that add to its appeal. It is believed that the Nandi statue in front of the temple is constantly increasing in size. Bellary Fort: Situated on top of a hill, the Bellary Fort exemplifies impressive architecture. The historic fort is home to a number of religious and historical monuments worth exploring. Daroji Bear Sanctuary: Situated in Bellary, this sanctuary is where you can see a number of sloth bears. The watchtower inside the sanctuary offers a vantage point for wildlife enthusiasts to watch the bears rushing down the adjacent hillocks during the evening hours. If you are traveling with kids, this stopover is a must! Ruins of Hampi: Once the center of the Vijaynagar Empire, Hampi is a ruined city that boasts of some of the most magnificent architecture existing in India today. The ruins of Hampi comprise forts, palaces, royal complexes, temples, pillared halls, and a lot more. 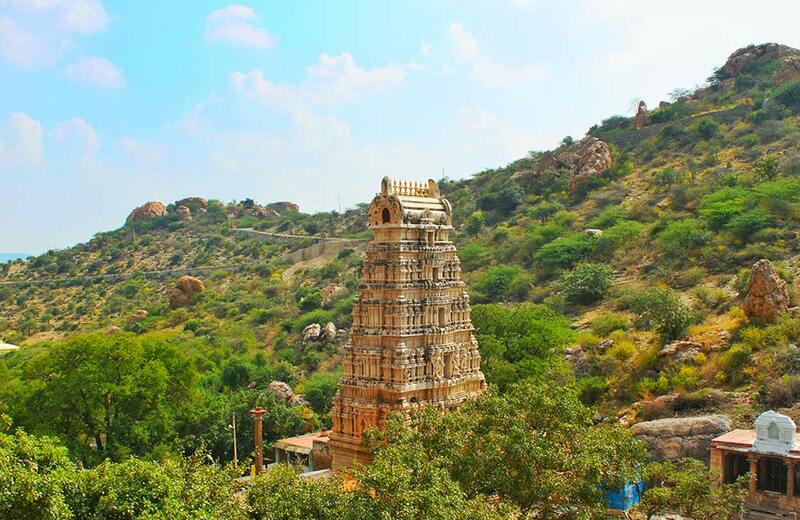 A visit to Hampi is akin to traveling to a land of historical grandeur. While traveling on these routes, you won’t find it difficult to come across eateries in the major towns. But always store water and snacks in your vehicle for those stretches on the road where the eateries are few and far in between. Also, since the routes are long, plan your night halts in advance. Finally, have a great time on the road from Hyderabad to goa!